Rawhide-Free, great-tasting and naturally delicious, it's no wonder Premium Pork Chomps have earned the loyalty of so many dogs! Pork Chomps are made of oven-baked pork skin, which is easily digested. When dogs switch from ordinary rawhide to Pork Chomps, the risk of developing an intestinal blockage is greatly reduced. And pet parents love the fact that dogs don't just chew them - they eat them - leaving behind no slimy messes to clean up. 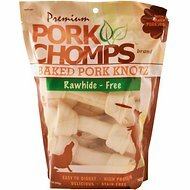 Premium Pork Chomps not only satisfy the instinctive need to chew, they also clean dog's teeth. With a wide selection of shapes, flavors, and sizes to choose from, the world of Premium Pork Chomps offers the perfect chew for every dog! Original Formulation: Pigskin, Chicken, Salt, Sugar, Potassium Sorbate (a Preservative). New Formulation: Pigskin, Sweet Potato Artificial Chicken Flavoring, FD&C Red No. 40, Sugar, Potassium Sorbate (a Preservative). If your pet is unaccustomed to this product, serve in a limited quantity initially. Excessive use may cause gastric upset. Intended as a treat , not food. Recommended size is slightly larger than your pet's mouth. Feed your dog responsibly and provide plenty of fresh water at all times. If this is a new treat or chew for your pet, serve in a limited quantity initially. Excessive use may upset their stomach. 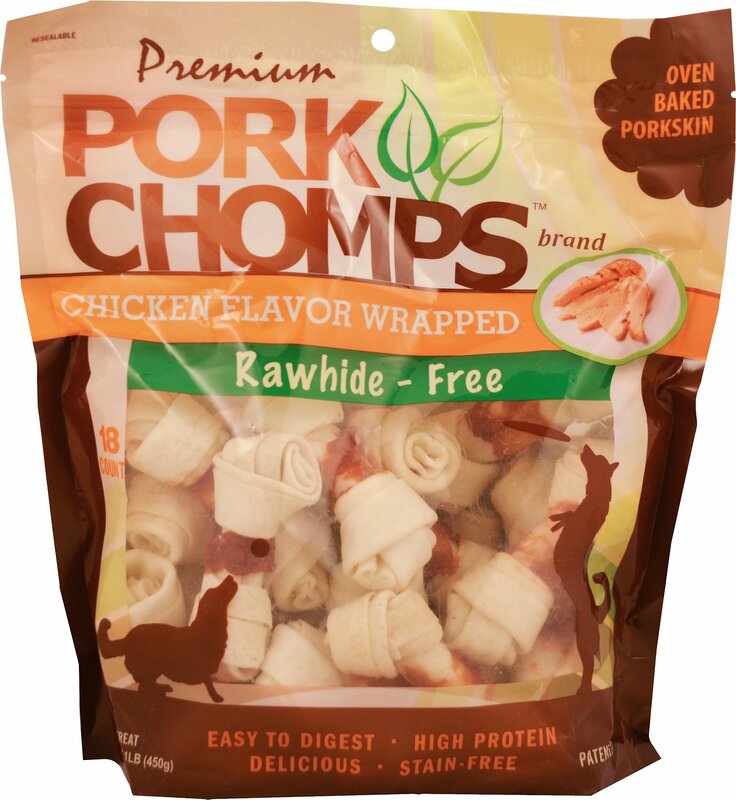 Premium Pork Chomps are 100% rawhide-free dog chews made from baked pork skin. Preferred nine to one over beef rawhide, these treats use a patented process to remove 70% of the pork's fat to create a low-fat, cleaner and healthier dog chew. Premium Pork Chomps come in a broad range of shapes, sizes and flavors, making them perfect for every breed and life stage. Most dogs seem to really like rawhide chews. But the truth is, rawhide is difficult to digest and stays in the system for days—seriously gumming up the gut and making your dog uncomfortable. And it can cause severe blockages. Premium Pork Chomps are 99.9% digestible, offering a safe, healthy alternative to rawhide, so your dog can continue enjoying his chew time without sacrificing digestive health. Finding the right chew for your dog is an art form. It requires choosing a bone that will satisfy his need to chew, provide prolonged entertainment and satisfy his taste buds. By keeping a variety of shapes and flavors on hand, your dog will never get bored—simply switch to a new one when necessary for a happy, satisfied pup. Long-lasting chews made of baked pork skin, wrapped in a flavor strip. Great for most dog sizes and available in a variety of delicious flavors. Baked pork skin that's knotted into the traditional bone shape dogs adore, with a variety of flavors that are sure to please any pup. Perfect dog chew for dogs ranging from medium to extra-large in size, offered in a variety of mouth-watering flavors that will get your dog's tail wagging. Your pup will spend a bit more time with Crunchy Bones than Munchy Sticks, but both are more of a treat than a chew—providing more instant satisfaction than the other chews. No matter the mood, Premium Pork Chomps has a shape and flavor to please. They offer oven-baked pork skin shaped into Chipz, Strips, Earz, Ribz, Braids and Pressed Bones to help keep your furry friend happy. Scott Pet, proprietor of Premium Pork Chomps, knows that pets are an integrated part of the family. For over 40 years they have remained family owned, priding themselves on a steadfast understanding of dogs, their needs and what's best for their health and overall happiness. Scott Pet and Premium Pork Chomps strive to make the pet experience enjoyable and positive by providing products that are designed and made with both quality and practicality in mind. We have a 5mo. old rottie. She likes these but chews them up quickly. I have purchased these at our local farm store but they were bigger. If I can't find bigger ones on chewy.com I'll buy local. OMG! My dog loves these! They are a great treat and keeps him busy. Would buy these again for sure! dogs love them. They know where they are kept, and after dinner they will sit and wait for there "treat"
These are a great treat for growing puppies. They entertain them and help with their need to CHEW! I gave these to a friend as I didn’t realize how small they are . Great for small dogs! I switched to the PORK CHOMPS chips and thought I would give these a try. My dogs love them. The PORK CHOMPS are so easily digestible that I don’t worry about them unlike the beef rawhide chips. This is my new rawhide! My dog loves this product. I would definitely recommend it. She loves this product and I feel good about giving her this product! So convenient to use Chewy! My 100 lb. Weimaraner just carries these around and hides them as if they were treasures, but has yet to really chew on one. I gave some to my friends with a lab and 3 yorkies and they argued over them with one Yorkie trying to steal everyone else's. I will try something else for my "chewer" and give the rest to the Yorkies. 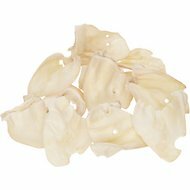 I love that these are rawhide free, my dog is obsessed with rawhide and when I got these, he couldn’t tell the difference so I’m happy!